The Dean ML Concert Ukulele, Satin Natural combines the sweet and melodic voice of the ukulele with edgy Dean ML shape to provide a unique ukulele for the alternative players. With a spruce and mahogany construction, the Dean ML Concert Ukulele delivers a resonant, sweet, rich warmth with a versatile playability due to its spruce top. The Dean ML Ukulele features a concert size body which is ideal for the ukulele soloists due to its extended range and 20 frets. Its extended range enables players to perform more technical skills and its cutaway allows easy access to upper frets with ease. The Dean ML Ukulele features a V shaped mahogany neck which adds warmth and resonance to the overall sound as well as making the electric players feel a bit more at home due to its V shaped profile. Finished in satin natural and decorated with subtle mother of pearl Celtic inlays which contrast well with the eye-catching ML body. 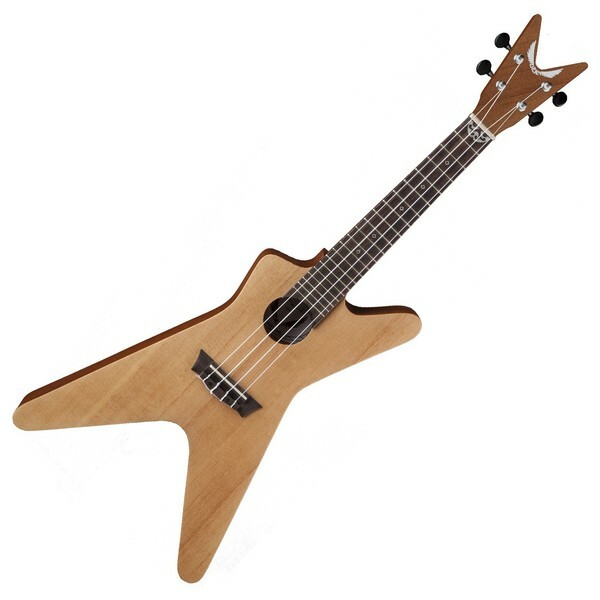 Ideal for those that want an instrument which stands out from the crowd. Included gig bag. The Dean ML Ukulele features a spruce top which generates a versatile tone that also offers a broad dynamic range, with deep lows, focused mid-range, and sweet singing highs. Its brightly toned spruce top is paired with mahogany back and sides for added warmth. Its mahogany back and sides offer more volume, and a strong balance between high-end and bass, which enables this uke to retain classic ukulele tone. Crafted from mahogany, the ML's neck offers a strong and durable play whilst providing players with plenty of resonance. Many ukulele necks are made from mahogany because the wood responds greatly to picking, strumming, and various finger techniques with equal ease. 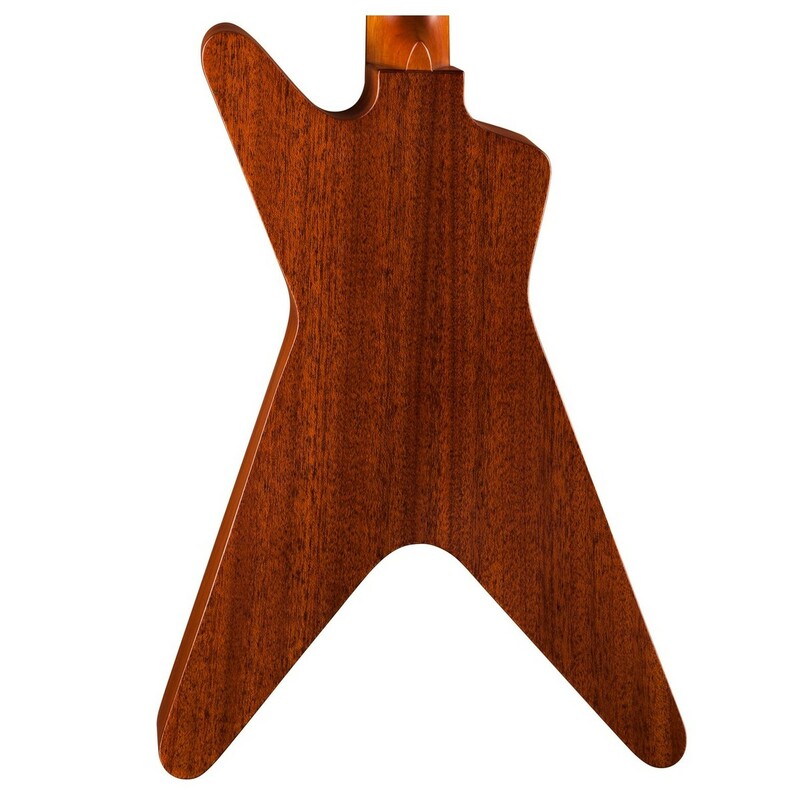 This unique ukulele has a soft V shaped neck profile which not only provides comfort, but is ideal for those electric guitarists that are used to playing similar shaped profiles. The neck is topped with a rosewood fingerboard that offers a smooth playing experience and is decorated with mother of pearl Celtic inlays for a smart appearance. The Dean ML features a concert size body, which produces rich and clear sound suitable for numerous techniques and styles of play. The ML has 20 frets and has become the choice of preference for ukulele soloists due to its extended range. The concert size and extended range enables players to perform more technical skills, whilst maintaining classic ukulele tone. In addition, the concert shape is slightly larger than standard soprano size and provides more volume due to more room for sound to vibrate around the body. 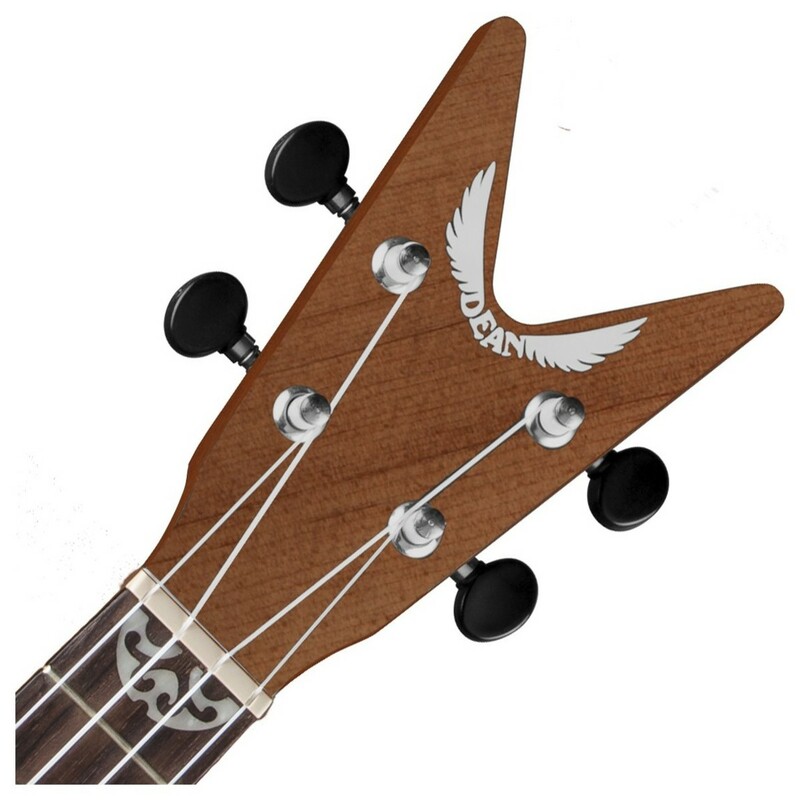 This special and unique uke also features Dean's ML shape which is lightweight and comfortable to play, yet also offers an edgy appearance for the players with a mental and heavy rock vibe.